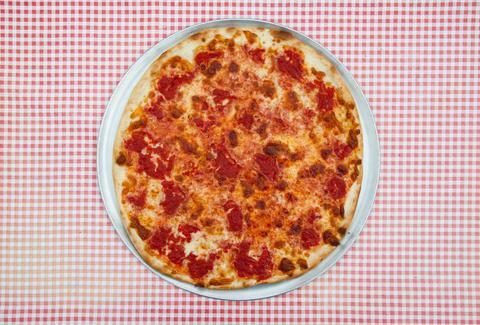 New Jersey’s large Italian community (third percentage-wise after Rhode Island and Connecticut) has ensured a steady stream of delicious pizza that rivals New York's, and a permanent place for it in the state’s gastronomical history. So the next time you’re driving through New Jersey on the way to the shore, on a road trip to DC, or to go antiquing in Lambertville, do yourself a favor and take a break for a slice at one of these places. Opened in 1945, Star Tavern still feels like a ‘70s-era tavern to this day with its wood paneling and neon signage. But the atmosphere is of little importance -- it's all about the thin crust, which beats anything you could get in New York. Unlike standard thin slices in NYC, this magical crust manages to be paper-thin but still somehow sturdy enough to hold every topping you could imagine without flopping. Put it to the test by ordering the everything pizza, with pepperoni, sausage, anchovies, mushrooms, onions, and peppers on top. It's fitting that a place whose name could also be a suitable moniker for a Mafia second-tier hitman is on a list about New Jersey pizza. With white and red tiles and a super basic interior, the vibe here is decidedly old-school. The pizza sauce is slightly sweet, though not overpoweringly so, and besides having an excellent cheese-to-sauce ratio, Big John’s also offers a double thick crust for those who like their pizzas thick but not square/Sicilian thick. The industrial Razza has truly elevated typical Jersey pizza to a more refined affair -- a stark contrast to other statewide favorites, which tend to skew more old-school. Razza even charges $4 for bread and butter, which sure, is totally ludicrous, but you better believe you haven’t had butter his delicious and fresh since you went to Amish country on an elementary school field trip. It's strictly local ingredients here (you'll even find a pizza with hazelnuts sourced from Rutgers University); the butter is grass-fed, the salt handpicked, and for god’s sake they put a dollop of cream on the pizza. 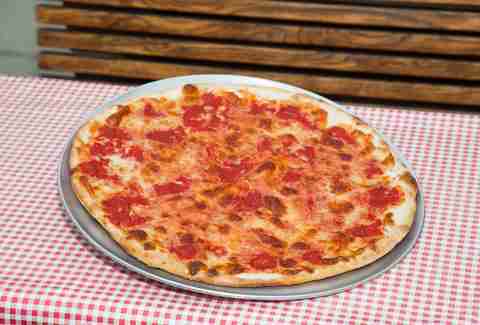 Maruca’s signature spiral sauce-topped pies are so iconic in the Jersey pizza lexicon that ignoring the Shore in a list of the best pizza would be like not mentioning Nashville when talking about the best hot chicken. Owned by four brothers (Anthony, Pasquale, Joseph, and Dominick -- does it get more Italian than that?) Marcua's has been a Seaside Heights institution since 1950, famous for swirling its sweet tomato sauce over a bubbling cheese base, creating a sauce-cheese ratio that no one could complain about. Maruca’s thin crust pizzas are crisp on the outside and soft and chewy on the inside, drawing in legions of fans from all over the Garden State. 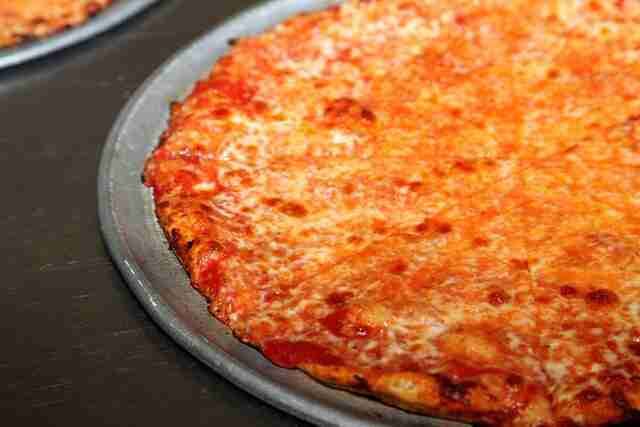 As the oldest pizzeria in Jersey and second in the country after Lombardi’s (although Papa’s challenges that), Papa's Tomato Pies rightfully deserves a place on the list of best pizzas in the state. Still run by the same family since its opening (not even Lombardi’s can say that! 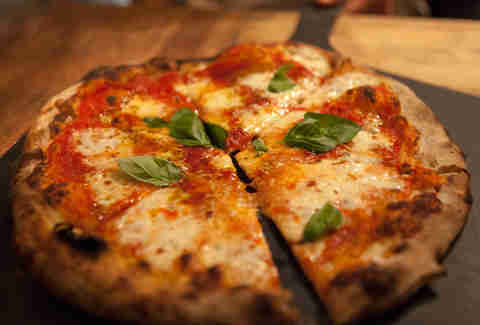 ), Papa’s is named after Giuseppe Papa, who came to New Jersey by way of Italy. The restaurant first opened in Trenton in 1912 but relocated to suburban Robbinsville in 2013. However, the family is so dedicated to sticking to the original recipe, they actually have water shipped in from Trenton. Be sure to try the mustard pie, in which spicy brown mustard is layered on top of the dough before adding the mozzarella and tomato sauce. People from North Jersey like to say they have the best pizza on lockdown, with their classic slice joints juxtaposed with upscale Neapolitan spots, but they are sorely mistaken. South Jersey is far superior to North Jersey on the pizza front, and that's due in large part to Bruno's Pizza & Restaurant. 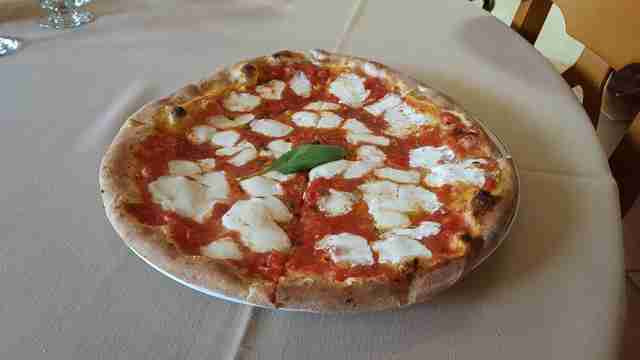 In addition to offering all the traditional slices, Bruno’s offers the most delicious and unique Sicilian margherita pie with melty buffalo mozzarella, as well as the perfect Grandma slice (which is basically a thinner slice of Sicilian). If you’re tired of plain cheese, Dominick's (also in South Jersey) expands on the traditional offerings by offering pizzas like cheesesteak, eggplant Parmesan, chicken club, and Bolognese. Kitschy, sure, but you better believe it works. The cheesesteak/pizza combo is also pretty fitting, as South Jersey associates itself with Philadelphia (while North Jersey associates itself with New York). And yes, even with all those toppings you can still fold the slices.